Apologies to Sondheim and Lapine for the updated title on this article. 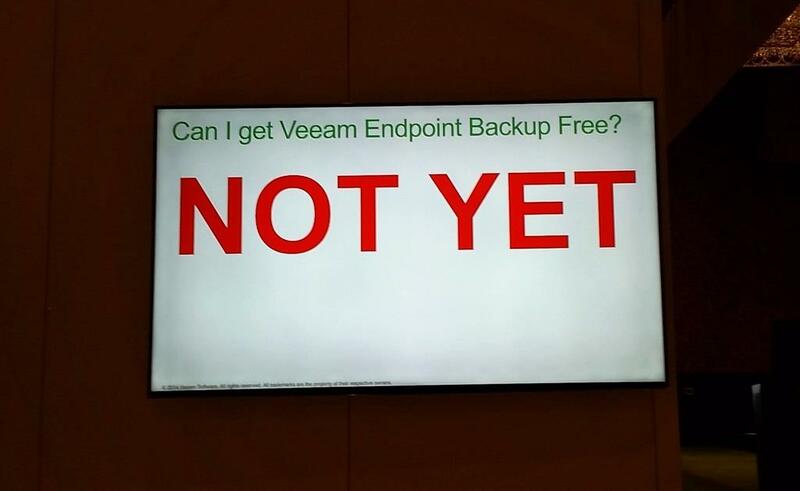 Veeam announced their “Endpoint Backup FREE” product in the wee hours of the morning Wednesday, as about a thousand attendeees of the first-ever VeeamON user conference were still recovering from the event party at LIGHT nightclub in Las Vegas. More on VeeamON in another post later… but let’s get back to the new product for now. Nope, this isn’t a hangover. Veeam, a leader in virtual machine backup/recovery and disaster recovery technology, is stepping out of the virtual world to allow you to back up bare metal systems. From early comments, this has been a long-awaited feature. Endpoint Backup FREE is a standalone software package targeted at IT professionals and technophiles for use on standalone systems with local or networked storage. It should fit into anyone’s budget, and with flash drives and external USB drives coming down in price, none of us should have an excuse not to back up our personal laptops and desktops anymore (I’m talking to me here). Veeam offers an “Advanced Recovery Disk” that enables you to do a bare metal restore to a point in time. With some products you can restore from a backup image to a new disk or replacement computer, but you have to install and patch your OS from scratch first. Other products may limit you to local storage, or require driver alchemy, but with the Endpoint Backup recovery disk, you can boot from it (i.e. USB flash drive or optical media) and restore your full system image from a network share on your LAN. Hey, can I back up a million Windows Servers with this product? No, you can’t, and you shouldn’t. Veeam are using a specific term in the product name–endpoint–to distinguish this offering from a bare metal server backup product. While it runs on Windows Server 2008 and later (as well as Windows 7 and later on the desktop side), it is being developed as a client OS backup solution. It does not have any central control or client management functionality, as it is a standalone program. This model doesn’t really scale for a large number of systems. However, if you’ve virtualized all but two or three servers in your environment, or if you run a small number of physical servers in a home lab, this can cover that gap without having to license an additional enterprise product for a small number of legacy servers. You can even use a Veeam infrastructure as your backup target, whether backing up Windows Server or the standard desktop offerings. Also, at this time Veeam does not support mobile devices (iOS, Android, Windows Phone, Sybian, Tizen, etc) so it is not a universal endpoint solution. You’ll want to either use your platform’s cloud option or something like Lookout or a carrier-specific app to back up your tablets and phones. What are the downsides to this new product? It’s not available yet. Veeam employees are doing an alpha test now. A public beta is expected in November, with general availability (GA) offering in early 2015. However, for me it’s not that bad as it will take me a couple more weeks to have any free time, so for once I can probably wait patiently. That’s right, no Macs. At launch, and for the foreseeable future, Endpoint Backup FREE will only support Windows systems. Today there is no Linux or Mac OS X support. You can of course back up the Windows VM on your Mac with this product, but you’d have to use one of the server products to back up Linux, and if customers request Mac OS X support enough, they will likely consider it down the road. For reasons that should be obvious, Veeam has chosen to support only current Windows OS revisions. Windows 7 and later and Windows Server 2008 and later will be supported. XP is out of service, and Vista is, well, Vista. Windows Server 2003 goes out of service next year. So for most users this will not be a major hindrance, but if your home lab has a lot of old Windows OSes, the Endpoint Backup FREE product will probably not fit your needs. And you should use this as an excuse to start upgrading (as if you needed any more reasons). It’s going to be an interesting year coming up, in the PC backup world. Veeam has a long history of free products, going back to their first product, FastSCP from 2006. Many technologically savvy end users will probably try out the new offering and then be tempted to check out Veeam’s other products if they haven’t already. I wouldn’t be surprised to see this functionality integrated and expanded into a paid/enterprise grade offering in Veeam’s future, incorporating feedback from the beta and first production release of Endpoint Backup FREE. There’s some logic in expanding from there to supporting bare metal servers in a scalable way as well. If Veeam follows this path, the other big backup players may end up with a bit of heartburn. You can sign up for the beta at go.veeam.com/endpoint and get notified when it’s available for download. Disclosure: Veeam provided me with a complimentary media pass to attend VeeamON 2014. No other consideration was offered, and there was no requirement or request that I write about anything at the event. As always, any coverage you read here at rsts11 is because I found it interesting on its merits. As some of you know, I’m starting a new job soon working with software vendors integrating their products around Cisco platforms. While it’s not my day job yet, I’ve been pondering some less explored options to look into when I do get settled in. This week I’m at the Asigra Partner Summit in Toronto, with my blogger/technologist hats on. I was a bit surprised to run into a Cisco 2900 ISR (Integrated Services Router) with a UCS E-Series blade module in it, in the hands-on-labs area of the Summit. For me, at least, it’s the unicorn of Cisco UCS; I’ve seen an E-Series system twice now, and once was in the Cisco booth at Cisco Live this year. What’s this Cisco UCS E-Series all about? The Cisco UCS E-Series blade gives you a single Xeon E5 processor, three DIMM slots, 1-2 2.5″ form factor drives, a PCIe slot, and the manageability of standalone UCS servers without the infrastructure overhead that would be cost- and space-prohibitive in a single or dual node B-Series or C-Series deployment. It does not integrate with UCSM, although you can run multiple blades in an ISR. It’s an intriguing platform for remote office/branch office (ROBO) environments, with the capability to integrate your routing/switching/firewall/network services with your utility server needs, including backup and recovery. But what’s it doing at the Asigra Partner Summit? As it turns out, this “Asigra Cloud Backup Connector Appliance” deploys the Asigra Cloud Backup software with the ISR and E-Series platform. It makes sense, and while I wish I’d thought of it sooner, or they’d thought of it later, it is a pretty cool idea. You can use the appliance as a standalone device, running Asigra DS-Client and DS-System software to collect and store your backups on internal storage. You can also use it as an aggregator or data collector running DS-Client, which would send the data to your DS-System server elsewhere (perhaps a standalone server on-site, or a datacenter or hosted vault). The one catch is that you’re a bit limited on the internal storage. Cisco has certified 1TB SATA and 900GB 10K SAS drives for the E140DP blade, which means you’re capped at 2TB raw in the server. Asigra has incorporated deduplication in their backup software for over 20 years, so depending on your data you’ll probably see 8-10TB (or more) capacity, but you may still hit some limits. How do we get around this capacity limit? If you want to use your Cloud Backup Connector Appliance as a standalone service, I see two possible paths, but each has its drawbacks. First, since the drive bays are standard 2.5 SATA form factor, you could install your own aftermarket 1.5TB or 2TB drives, doubling your capacity to 3-4TB raw. This means you’re managing your own disks though, and it could complicate Cisco support (although if you’re tearing into the gear you probably already know this and understand the risks). Second, since you have a PCIe slot in the server, I could imagine either installing a PCIe flash card (such as the 3.2TB Fusion-io “Atomic” ioMemory SX300 card just announced last week) or a SATA/SAS storage controller connected to some sort of external array. There are two downsides to this second option. Cisco has not announced certification of anything but a quad-port Gigabit Ethernet or single-port 10-Gigabit Ethernet controller in the PCIe slot (so you’re blazing your own trail if you swap them out–they should work, but…). And if you put storage in that slot, you can no longer expand networking, and will be limited to two internal (chassis) ports and two external (RJ45) ports for Gigabit Ethernet networking. Oh, and a third concern is that you lose the encapsulation factor with your storage hanging off of the server rather than being inside the server. As I ponder the pitfalls to the PCIe expansion option, I find myself wishing for a dual-Ethernet / SAS card similar to what Sun used to sell for Ethernet and SCSI back in the day. I think HP had a single port combo as well. Alas, both of those are antiquated and are PCI-X instead of PCIe. You could use FCoE from the 10-Gigabit Ethernet card if you have that infrastructure in place, but that might be beyond branch office scale as well. So what are you saying, Robert? I may be overengineering this. I’ve done that before. Dual 10-Gigabit in my home lab, for example. For a branch office with ~20 500GB desktops, a pile of mobile devices, and a server or two, with judicious backup policies, you’re in good shape with the standard configuration. Remember, you’re deduplicating the OS and common files, compressing the backed-up data, and leaving the door open to expanding your Asigra deployment as your branch offices grow. And if you choose to, you can run a hypervisor on your E-Series server, with Asigra DS-Client/DS-Server VMs as well as your own servers, to the limits of the hardware (6-core CPU, 48GB RAM). The system can boot from SD card, leaving the internal disk entirely for functional storage and VM data stores. Even with the 2TB raw disk limitation (which will probably be addressed eventually by Cisco), you have a very functional and featureful option for small offices, remote offices, and even distributed campus backup and recovery aggregation. You get all the benefits of Asigra’s software solution, including agentless backup of servers and desktops, mobile device support, dedupe and compression, FIPS 140-2 certified encryption at rest and in flight, and Asigra’s R2A (Recovery and Restore Assurance) for ongoing validation of your backed-up data. And you get the benefits of Cisco’s ISR and E-Series platforms for your networking services and server implementation. You can purchase pre-installed systems through an Asigra Service Provider, or if you already own an ISR with an E-Series server, your Service Provider can install and license Asigra software on your existing gear. I am attending the Asigra Partner Summit at Asigra’s invitation, as an independent blogger, and the company has paid for my travel and lodging to attend. I have not received any compensation for participating, nor have Asigra requested or required any particular coverage or content. Anything related on rsts11.com or in my twitter feed are my own thoughts and of my own motivation. Also, while I am a Cisco UCS fanboy and soon to be a Cisco employee, any comments, observations, and opinions on UCS are my own, based on my personal experience as well as publicly available information from Cisco and other vendors. I do not speak for Cisco nor should any of my off-label ideas be taken to imply Cisco approval or even awareness of said musings.